In this lesson, we will learn about the rotation symmetry for a cube and tetrahedron. 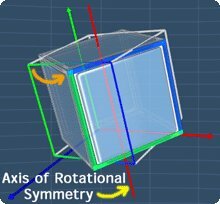 After familiarizing with the basics on rotational symmetry, we can now examine the rotational symmetry for three dimensional (3D) objects. In this lesson, we will see examine all the axes of rotational symmetry for a cube and tetrahedron. For 3D rotational symmetry, the ideas are basically the same as 2D Rotational symmetry. 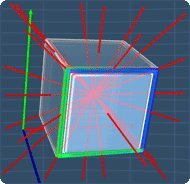 Looking at the picture, when we rotate the cube 360o about the axis, notice that the cube will fit (i.e. match) itself for 4 times. When this happens, the axis is called the axis of rotational symmetry of order 4. Note that, the cube has a total of 13 axes of rotational symmetry. You can view them by watching the math video below. Also, the step-by-step solution shown in the practice question will show you the pictures for these axes. As for the tetrahedron, it has a total of 7 axes of rotational symmetry. You can view these axes in the math video below. Also, the step-by-step solution shown in the practice question will show you all the pictures of these axes. 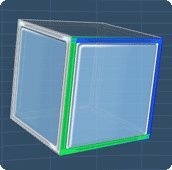 Now, consider this cube. When we rotate the cube about this axis for 360 degrees, we can see that, the cube matches itself for, one.. two... three... four times. With this, we can say that this axis, is the axis of rotational symmetry, of order 4. Now, this cube has more than one axis of rotational symmetry. Let's explore them one by one. This is the second axis of rotational symmetry. When we rotate the cube about this axis, we can see that the cube matches itself for one... two... three...four times. Hence, this axis of symmetry has order of 4. As for the third axis of rotational symmetry, it has order of, ...one... two... three... four. For the fourth axis, this axis has order of...one...two...three. For the fifth axis, this axis has order of...one...two...three. For the sixth axis, this axis has order of...one...two...three. For the seventh axis, this axis has order of...one...two...three. For the eighth axis, this axis has order of...one...two. For the ninth axis, this axis has order of...one...two. For the tenth axis, this axis has order of...one...two. For the eleventh axis, this axis has order of...one...two. For the twelfth axis, this axis has order of...one...two. For the thirteen axis, this axis has order of...one...two. Finally, we can see that this cube, has a total of 13 axis of rotational symmetry. That is all for this video demonstration. 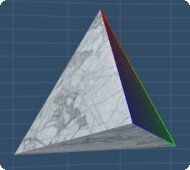 This is a demonstration on rotation symmetry for a tetrahedron. Now, consider this tetrahedron. 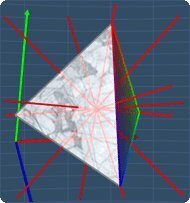 When we rotate the tetrahedron about this axis for 360 degrees, we can see that, the tetrahedron matches itself for, one.. two... three.. times. With this, we can say that this axis, is the axis of rotational symmetry, of order 3. Now, this tetrahedron has more than one axis of rotational symmetry. Let's explore them one by one. This is the second axis of rotation symmetry. When we rotate the tetrahedron about this axis, we can see that the tetrahedron matches itself for one... two... three times. Hence, this axis of symmetry has order of 3. As for the third axis of rotation symmetry, this axis has order of, one...two...three. For the fifth axis, this axis has order of...one...two. For the sixth axis, this axis has order of...one...two. For the seventh axis, this axis has order of...one...two. Finally, we can see that this tetrahedron has a total of 7 axis of rotational symmetry. That is all for this demonstration. You can start by going through the series of questions on rotation symmetry or pick your choice of question below.